This is the moment an impressively romantic man serenaded his wife at their wedding ceremony. Dean Conaghan broke into song as his beautiful bride sat and watched him in awe. 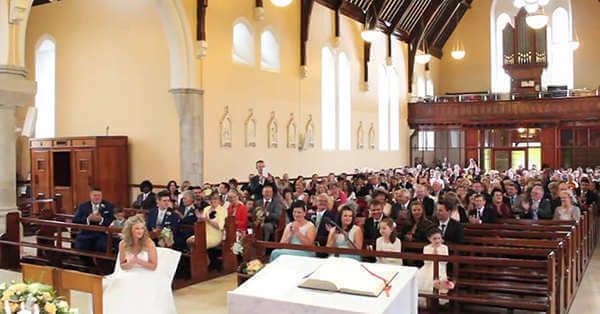 This Donegal gent has just put the rest of the men in Ireland to shame as he has made the sweetest gesture to sing to his beloved wife on their wedding day during the ceremony. It's not the first time guests have been left speechless at an Irish wedding. By choosing not to wait to sing until the end of the night when he will be probably be full to the brim of beer, and instead singing to her during the ceremony, Dean Conaghan has broken the tradition, and he has done it well. This version of Ave Maria has very quickly become one of our most favourite. click the video button below . . .
Well done to you sir! Gerry Duffy has produced over 1600 Wedding Videos since 1979, and now you can avail of his vast Experience in Weddings - to enhance Your own wedding. Gerry would be delighted to have a chat with you on the phone, or to sit over a coffee, and help you with recommendations for Suppliers of any other type of Wedding Services that you are trying to find. Organising a wedding is a daunting task, but you will find the PARTNERS page on this website, to be a terrific source of help. On it, you can contact any of Gerrys recommended suppliers, and If you still havent found what you need; call Gerry on 087-2586-400; Gerry is sure to be able to help you.